I’m somewhat surprised that Age of Chance were included on CD86. It’s nothing to do with the quality of their music but more that it doesn’t comfortably tie in with much of the rest of the indie/twee nature of the other songs. The four-piece, consisting of Steve Elvidge, Neil Howson, Geoff Taylor and Jan Perry, came together after meeting at Leeds Polytechnic College and their first two singles came out on their own Riot Bible label. They were an unusual lot in that they wore cycling clothing while performing (at a time when the sport was far from cool and seen as geeky) and their music was a combination of styles, including a form of the newly emerging hip hop sound, with strident often spoken vocals delivered over rock and punk guitar chords. The second Peel session in June 1986 brought them some more interest thanks to what was a brave and unusual cover of Kiss which was riding high in the charts at the time with Prince being regarded as the new king of pop music. The cover was then recorded as a track for a mini-LP for the Sheffield based label Fon and in due course would be voted in at #2 in the end of year Festive 50 on the Peel show. This led to Age of Chance signing to Virgin Records in January 1987 and a stab at the big time. Three singles and a debut album were released that year but without any huge breakthrough – a lot of critics seemed to say they had never released anything as good as the Prince cover and were unlikely to ever do so (which was unduly harsh). The beginning of the end came in the autumn of 1988 when Elvidge, who was the lead vocalist, left the band during the middle of sessions for the next album. The music was completed and a new singer, Charles Hutchinson, brought on board the following year to add the vocals. This led to a delay in the release of the album and it bombed completely when it eventually reached the shops at the tail end of 1989. The band did soldier on for another year or so relying on what were always regarded as decent live performances to maintain enthusiasm but they eventually called it a day in early 1991. 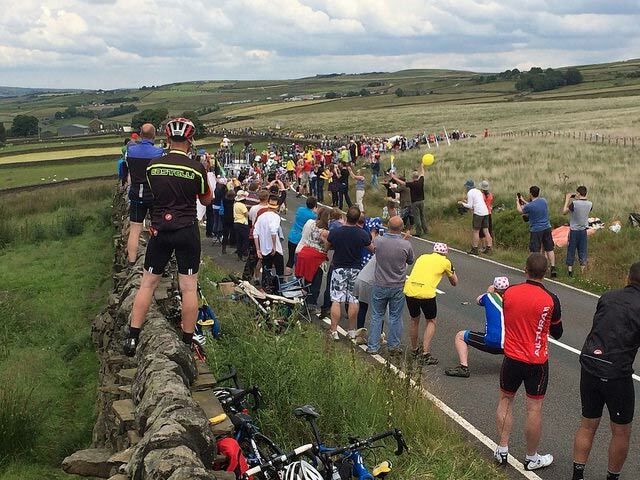 Like Adam over at Bagging Area, I too was not going to let slip a chance to see the Tour de France as it hit the North. So we set off from Manchester Victoria early on Sunday morning on a train packed to the rafters to Mytholmroyd, just beyond Hebden Bridge in West Yorkshire. Parking our camping chairs on a grass verge at the bottom of Cragg Vale – at five and a half miles, England’s longest continuous single gradient – we and thousands of others waited three hours or more in glorious sunshine for the peloton to pass. Preceded by the publicity caravan, and a host of police cars and motorbikes, half of them your actual French Gendarmerie, they were upon us and gone in a flash. As a cycling fan who grew up watching Bernard Hinault, Greg LeMond and Laurent Fignon, initially on ITV’s World Of Sport, then on Channel 4’s early coverage, when it was on for a whole thirty minutes a day, I never thought I’d get the chance to see it so close to home. At one point they were a mere fifteen miles from our house. There were tears in my eyes after the boys in Lycra had gone round the bend up the road. It’s surprisingly easy to tie in the Tour with 80’s indie music. First of all, because the rather wonderful theme music to the Channel 4 coverage of the time was written by none other than Pete Shelley. 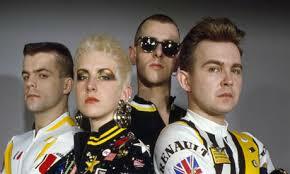 Secondly, when cycling garb is now all the rage, in the 80’s it was only really worn by… cyclists. Except that is, for The Age of Chance. 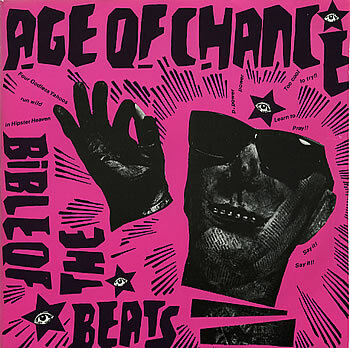 Age of Chance formed in Leeds – which saw Saturday’s Grand Départ – in 1985, and were signed to Fon Records of Sheffield, where Sunday’s stage finished. They were darlings of the indie scene, often touted at the time as the band most likely to succeed, but they never really did. Coupled with this, they were never seen out wearing anything else than kit of some of the biggest cycling teams of the time, notably Renault-Elf and Système-U. Because of their obvious love of design, they were sometimes unfairly derided for being more style over content, but they were a blistering live band who knew how to work a crowd. Their greatest success was an Indie Number One with their cover of “Kiss” in 1986, at a time when few of us indie kids would dare admit to even listening to Prince. Two years before The Art of Noise did their own version, theirs is far superior, yet virtually forgotten. Despite signing to Virgin in 1987, success always eluded them. They finally split in 1991. Where they are now, I’ve no idea, but I bet they out at the roadside this weekend, cheering on the peloton through Yorkshire, getting envious glances at their vintage cycling gear.